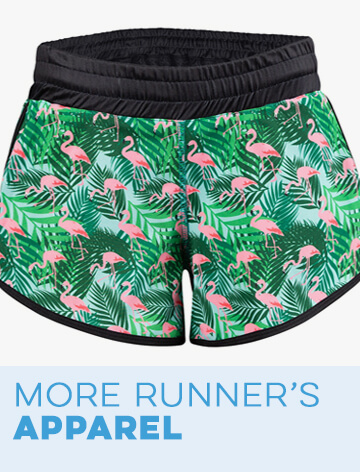 The ideal recovery item that all of us runners should purchase. I ordered the PrSoles with the traveling bag and I am so happy with the purchase. I have bought 2 pairs of PR soles and I tell the ladies that I coach to buy them. 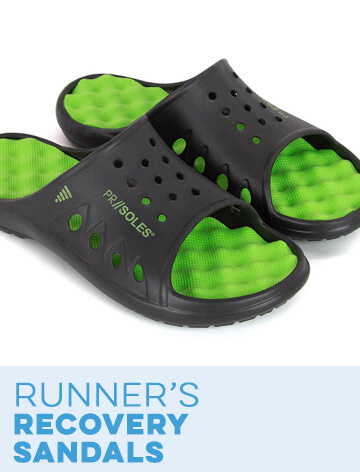 For folks with flat arches they are the ideal recovery item that all of us runners should purchase. One of the nicest and sharp looking cases I've ever seen. I've been a customer of yours for a few years now. I just wanted to take a moment and recognize the great products and customer service your company has. I recently purchased a bamboo iPhone 5 case and I made it custom with the word "Relentless 26.2", the case arrived today and I just have to say this is by far one of the nicest and sharp looking cases I've ever seen. It's items like this that sets your company apart from others and you are always first to market with new things. It's because of this I will continue to be a customer of yours and I will spread the word to my friends and family. Again, job well done and happy running! Thank you so much for your wonderful service and variety of products. 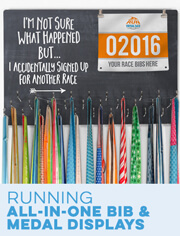 I ran the Knoxville Marathon relay this weekend and called on Wednesday to inquire about the possibility of receiving personalized products by the end of the day on Friday. The customer service was outstanding and I received my shipment before lunch on Friday. The personalized water bottles were gorgeous and a real hit with my relay teammates. I also purchased the Sole Sister InspireME bracelets which were perfect! 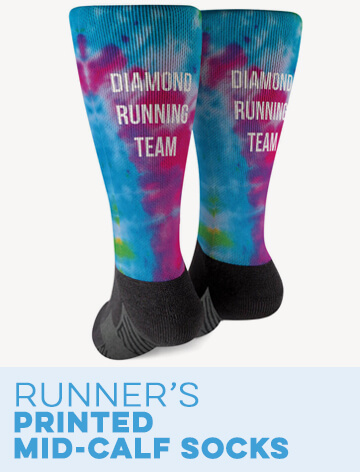 We wore them on race day. Hi, just received shirts. Thank you so much for the quick turnaround and shipping! I really appreciate your helpfulness and will definitely be shopping with you again! Just wanted to say thank you for a quick and accurate delivery of my purchases. All done within a few days of Christmas which makes it even more impressive. Will recommend your site to family and friends. I received the package today and wanted to send you a quick note to say thank you for your awesome customer attention!! 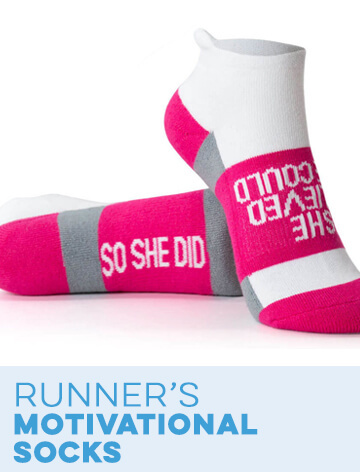 My wife is the big runner in our house so I am sure she will love every bit of it. Good customer service is rare in today's day and age, and I want to take a moment to give "kudos" where they are due. From the prompt response to my initial email (much faster than I expected: thank you, Rachel), the helpful information in that email, and the outstanding customer service on my phone call (thank you, Bobby), your team did a great job from start to finish. 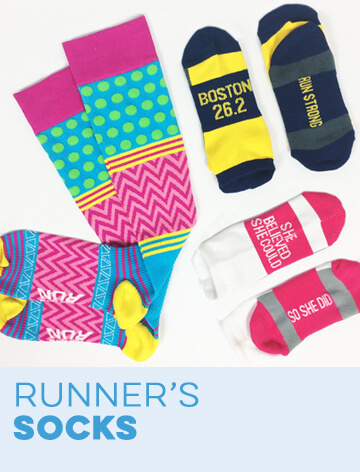 I'm looking forward to receiving all my customized items for all the runners in my circle. Again, thank you for a job well done. Keep up the good work! The items I ordered were FANTASTIC!!! My athletes were very pleased. I will definitely be shopping with you next season. Thank you!!!! I just wanted to let you know how pleased I am with your service - teddy arrived today and very impressed with the quality of the product. I got my order today. Thanks for the quick delivery! I will definitely order from you again and will tell my friends. 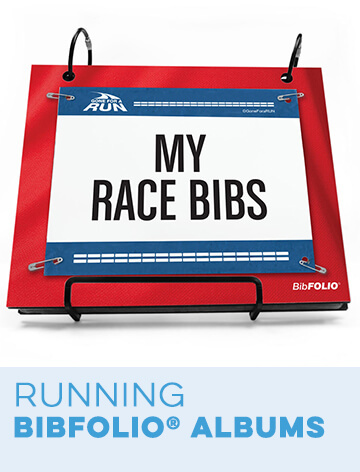 I ordered a (HUGE) BibFolio for my dad who has been a runner for 30+ years. He has a recurring knee injury and hasn't been able to run like he used to for years. He had collected all of his bibs over the years- numerous marathons, half marathons, and 10Ks. He was so excited when I got him this present for Father's Day. His new project is organizing his bibs to display in his fancy new BibFolio. Thank you so much for making this great product. It was so much better than I was expecting! You will have my business going forward. I do not typically contact companies after receiving merchandise but I felt compelled to do so in this instance. I do not think I could have had a better "online" experience. The customer service rep that took my order was engaging, prompt, efficient and knowledgeable. My order shipped quickly and was received ahead of time. I could not ask for more. I just wanted to thank you again for going out of your way and giving me extra help with my order. It's things like this that show you care for others & the company you work for. I Love this company & I'm always sharing your pages on Facebook. If I have a question or a problem - it is answered & pretty quickly - - I don't need to wait more then 48 hours for a response....like a lot of other web pages say. Whatever magic you did worked!! Thank you very much. Unbelievable customer service and say great job for everything! Thanks to your UPS support staff as well. Today I received in the mail a shirt that I ordered from your website. Not only did you specially-order/make the shirt for me (so I could have the Boston clover on a women's tech shirt that I'll wear at my Boston Marathon qualifying race), but you sent it with this massive and amazing wall calendar! 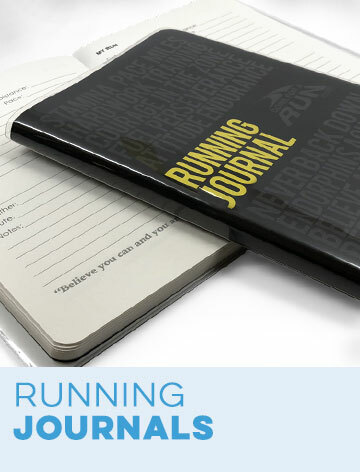 I'm so excited to use the calendar to track my runs this year! What a great company!! Thank you, thank you!! I L-O-V-E the ID Bracelets! I received my bracelets! I L-O-V-E them! They fit me perfectly (tiny wrists that I could sue for non-support) and the ID plate is perfect and correct! Thank you so much for the fast service! Thanks for your prompt attention to my email and the phone call. Your customer service is as good as all the reviews state if not better in my opinion. My daughter received her package and loved the headbands. Great product Great service I will order from you again. Just wanted to send a note and say "Thank you" for the great customer service. This is the first time I've placed an order with you and the items shipped quickly. I had to exchange a couple of items and that process was quick and simple as well. I appreciate the customer service and will be ordering from you again in the future. Rokbands, Can't Live Without Them! Wore this hair band for the NY half, have been googling for 2 days to try and find more. can't live without 'em!! Your site is extremely impressive and so was the customer service! I placed an order yesterday. Haven't received it yet, but wanted you to know I think you have the greatest web site. I have been searching different ones for weeks and have not found any that have the variety like you. I found no other "ultra" or 50k out there. Your site is extremely impressive and so was the customer service girl who took my order by phone. I'm sure your product quality will be just as impressive. I look forward to ordering with you in the future. You Guys are amazing. I got exactly what I ordered and got it 2 days earlier than I requested. In fact I got my package about 18 hrs after I ordered it. I will definitely be ordering from you again soon. Thank You very, very much. You were So FAST and the Merchandise was SO NICE! 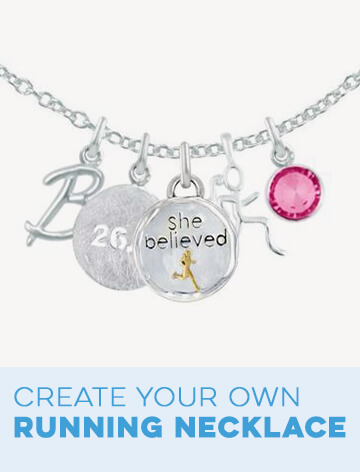 I purchased the Half-Marathon 13.1 Message Ring/Pink and Silver Running Shoe Necklace for my wife. It was for you eleventh year anniversary. She loved it. Thank you very much for you all of your help. The necklace arrived on time. Thank you so much! You guys have been great!!!! I understand that there are some things you can't control, (the availability of certain color), but some things you can, like exceptional customer service, doing all the right things, and you have! We will be back to order more! Customer Service should take lessons from YOU! You people are Great! Customer service around the world should take lessons from you. Thank you for all your help in getting my order straight. Thank you. I received my ordered of the personalized dog tags with my daughter's picture. I can't tell you how pleased I am! They are excellent gifts. With lockets you have to open it to see the picture--With the photo tags it shows the photo as it hangs on the necklace. I am also impressed with the quality of the image. You need to spread the word about these tags--they are too cool to pass up! Maybe you could offer another style of necklace for the photo dog tags...a chain from your existing necklace selection. (rubber, leather, or sterling silver, just a suggestion). Also, I could hardly believe how fast the order was sent----lighting fast! Very Pleased Customer! Will suggest your site to all friends and family! Design is Really CUTE and Fits WELL! I received a running shirt as a gift from my husband and kids for Mother's Day in the bright purple color. I have gotten quite a few compliments on the shirt. 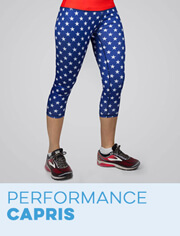 The design is really cute and the shirt fits well, not too tight and not too loose.